An extension for Visual Studio that enables the use of macros in the IDE. The extension can record most of the features in Visual Studio including text editing operations. Macros for Visual Studio is an extension for Visual Studio that enables the use of macros to automate repetitive tasks in the IDE. 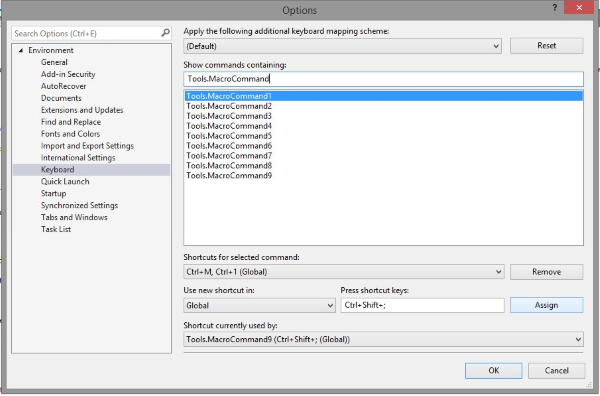 The extension can record most of the commands in Visual Studio including text editing operations. To do so efficiently, place your cursor before the "p" of the first private then start recording a macro (CTRL+M, R). Select the next word, type in "public" then go to the end of the line, go back two words, select the first letter, make it uppercase (CTRL+SHIFT+U). Finally, go to the next line and place the cursor at the beginning of the line and stop recording (CTRL+M, R again). You can then playback the macro (CTRL+M, Enter) or play it back multiple times (CTRL+M, I). After installing the extension, the Macro menu will appear under Tools > Macros. Under this menu, you'll find commands to record and playback a macro. The Current macro is a temporary macro that holds the last recorded macro. To persist it, use the Macro Explorer toolbar command Save Current Macro (or right-click the Current macro). Name the new macro and assign a shortcut if you wish. The new macro will then be persisted on your file system. To assign a shortcut to a macro, right-click the macro and then Assign shortcut. Select a shortcut from the list and hit OK.
Go to Tools > Options > Keyboard (or click on "Assign custom keyboard shortcut" in the previous dialog). Search for Tools.MacroCommand# where # is the number of the predefined shortcut you assigned your macro to. Q: How can I modify the shortcut to record, playback and playback multiple times? A: Go to Tools > Options > Keyboard and look for Tools.StartRecording, Tools.Playback,Tools.PlaybackMultipleTimes. Q: How can I assign a custom keyboard shortcut to a macro? A: See assigning a custom keyboard shortcut above.